Pour the milk and cream into a pan and heat until just boiling, then remove from the heat. Meanwhile, put the cornflour and sugar in a mixing bowl, whisk to remove any lumps, then whisk in the eggs until smooth. Pour half the hot milk mixture over the egg mixture, whisking constantly. Pour the egg mixture into the pan with the remaining milk mixture and put the pan over a low-medium heat. Whisk until thickened, smooth and glossy (about 3 minutes), then remove from the heat and beat in the Cointreau and orange zest. Pour into a bowl, cover with cling film touching the surface (to prevent a skin forming) and leave to cool, then chill for 2-3 hours (see Make Ahead). Lightly flour a work surface, halve the chilled dough and roll each piece to a 20cm x 30cm x 3mm thick oblong. Put on a baking sheet, stack between sheets of baking paper and chill for 30 minutes. Once chilled and still on baking paper, use a saucer or cup as a guide and cut out 6 x 15cm discs from each sheet. Carefully line each tart case with a disc of pastry and trim off any excess (see tip). Chill for an hour. Heat the oven to 160°C/140°C fan/gas 3. Line the tart cases with baking paper and ceramic baking beans (or uncooked rice), put on baking sheets and bake for 30 minutes. Remove baking beans/rice and paper and bake for 5 minutes until the pastry feels sandy. Cool in the tins. Set aside 100g strawberry jam for the glaze and divide the remaining jam equally among the cooled cases. When the pastry cream is chilled, transfer to the piping bag and pipe the tarts three-quarters full, covering the jam. Pick the best (and similar in size) strawberries to decorate the tarts. 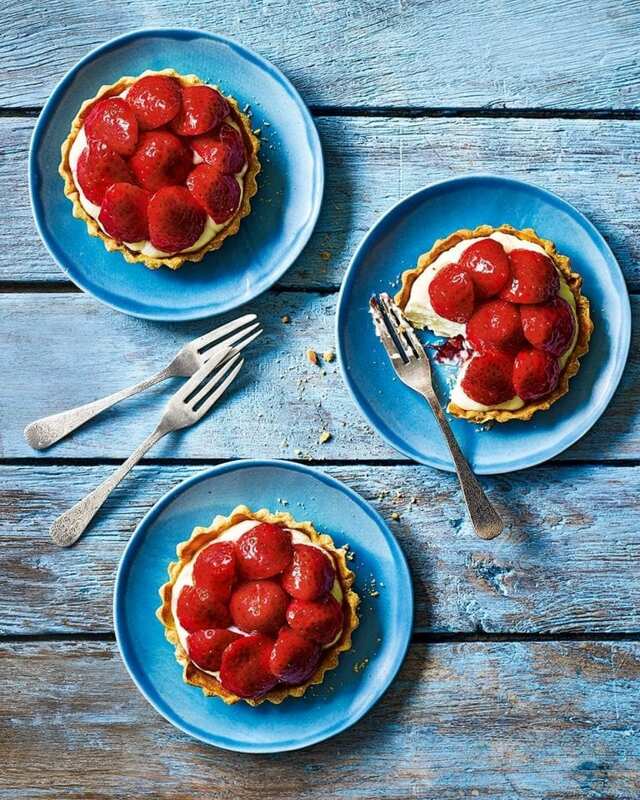 Put a whole strawberry, tip upwards, in the centre of each tart, then halve the remaining ones and arrange around the central strawberry. Melt the reserved 100g strawberry jam in a small pan with a splash of water and a squeeze of lemon juice and stir until smooth. Brush over the strawberries to glaze. Serve as dessert or as part of an afternoon tea. Make the tart cases and pastry cream a day ahead. Keep the cream covered in the fridge.